The first ever vaccine for drug addiction has just been created. By combining a cocaine-like molecule with part of the common cold virus, you get a vaccine that turns the immune system against cocaine, keeping it away from the brain. So far, the vaccine has only been tested on mice, but the results are extraordinary. 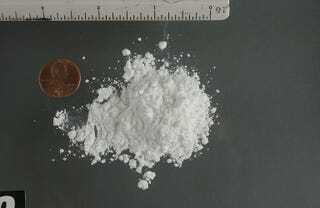 Mice given the vaccine no longer exhibited any of the hyperactive signs of a cocaine high when they were next given the drug. The vaccine was created by taking just the part of the cold virus that alerts the body's immune system to its presence, and then researchers connected the signalling mechanism to a more stable version of the cocaine molecule. Once the mice received an injection of the vaccine, they started producing anti-cocaine antibodies which targeted and destroyed any cocaine that then entered their system. Normally, cocaine does not produce an immune response, leaving it free to wreak havoc on the brain and body of whoever takes it. But the cold virus segments taught the immune system to treat cocaine like a hostile invader, offering a nearly impregnable wall of protection from the cocaine's effects. "Our very dramatic data shows that we can protect mice against the effects of cocaine, and we think this approach could be very promising in fighting addiction in humans. While other attempts at producing immunity against cocaine have been tried, this is the first that will likely not require multiple, expensive infusions, and that can move quickly into human trials. There is currently no FDA (Food and Drug Administration) approved vaccine for any drug addiction.The vaccine may help [drug addicts] kick the habit, because if they use cocaine, an immune response will destroy the drug before it reaches the brain's pleasure center.